Welcome to my blog! Join me in my world..my daily journey of motherhood... where I share Random Thoughts, Recipes, Health and Wellness info, Product Reviews, Giveaways, Inspirational Words, Practical things I do as a mom and a wife, Family Stuffs and Anything that I want to blog about. Just got back home from giving the kids a lift to school. I felt very hungry and my stomach was ready for breakfast. I was looking for a quick fix since I have no time to cook. I immediately made coffee to give myself some boost for the chores waiting ahead. 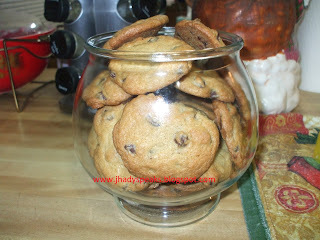 Then I spotted a jar of cookies on the kitchen counter that I baked 3 days ago. It's a dark chocolate chip cookie, so soft and yummy. Then the battle begins in my head. To have or not to have a cookie for breakfast? It's really hard to decide not to have it since I know how good it was. However, I care about my health and the quality of breast milk I'll be producing, and to live up to the example of what I blog about. I decided to have a peanut butter sandwich instead. Peanut butter is high in protein and a good energy source to start your day. My bread was whole grain with sesame seeds on it. I guess I made a good choice. Some of you might be asking why I drink coffee when I am breastfeeding. Pregnant or nursing moms are allowed to drink 1-2 cups of coffee a day. I only drink one and If I decided to have another cup in the afternoon then I go for decaf. Coffee has health benefits too and just like any food when taken too much can give you a health risk. These look so good! I love cookies especially chocolate chip! My son would love that sis, he has a sweet tooth hehehe. I'm eating cookies with coffee or cola...I liked this way. Learn some other quick and healthy meals for you and family. totally the best quick snack is by having a bowl of cookies would help us fill a hungry stomach. I also like having cookies for breakfast as it's not too heavy. One thing that I am not fond of doing is baking, so we seldom have cookies at home unless it's a store bought. Thanks for reading my post. I will be delighted to hear from you so please feel free to leave a comment. Look Who Turns 6 Months Old Today!! See What I Got In The Mail!! Find Out How and Where To Start Blogging? Copyright©2013 Journey To Jhady's World. All Rights Reserved. Awesome Inc. theme. Powered by Blogger.